Earlier study has found broad trends linking earlier spring weather, rising temperatures and increased forest fires, suggesting that climate change may play a role in fires like the Waldo Canyon blaze outside of Colorado Springs, which has burned more than 18,000 acres and consumed about 300 homes. In 2006, researchers at the Scripps Institute of Oceanography in California analyzed 1,166 fires between 1970 and 2003 and found a dramatic increase in fire potency in the late 1980s. Though wildfire is a natural part of the western landscape, the researchers concluded that a warming climate was ramping up warm winters and springs, exacerbating natural fire cycles. The study found that human activities such as livestock grazing and suppression of small fires compounded the problem, creating denser forests ripe for large blazes. 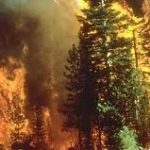 An analysis of 1,500 years of fire and tree-ring data revealed that a combination of climate change and human forest use could explain modern ‘mega fires,’ the kind that destroy large swaths of forest. 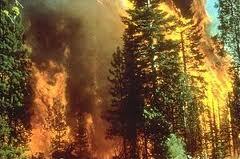 Fires were associated with a dry year following several wet years, because the moist periods allow undergrowth to spring up and provide fire fuel in dry years, researchers reported in May in the journal The Holocene. Our continuing emissions of greenhouse gases, global warming is anticipated to make wet regions wetter and dry regions drier. To some extent that is already happening, a dry winter set the stage for an early fire season. Worse, warmer winters have allowed pests like the mountain pine beetle to thrive. The insect has munched its way through mountain forests from British Columbia down through Colorado, leaving plenty of dead timber to fuel fires, also a consequence of the fire suppression policies of past decades. Because winter snow pack was lighter than usual and melted sooner, fire season started earlier in the U.S. West, with wildfires out of control in Colorado, Montana and Utah. The high temperatures that are helping drive these fires are consistent with projections by the U.N. Intergovernmental Panel on Climate Change, which said this kind of extreme heat, with little cooling overnight is one kind of damaging impact of global warming.